Last month, for instance, Whole Foods managers visited a site in Utah that used to host a Kmart store. The store shut down in mid-2017 among its parent company’s financial woes and has been vacant ever since. Whole Foods now has more than 470 stores around the country, still a far cry from its competitors in the grocery space, including Walmart and Kroger. Eighteen months after Amazon’s acquisition, Whole Foods now has the money to open new locations in areas that were once out of reach, including states like Wyoming and Montana. Sears, on the other hand, hasn’t been profitable since 2010. Over the past three years, it has closed 123 Sear stores and 205 Kmart stores. 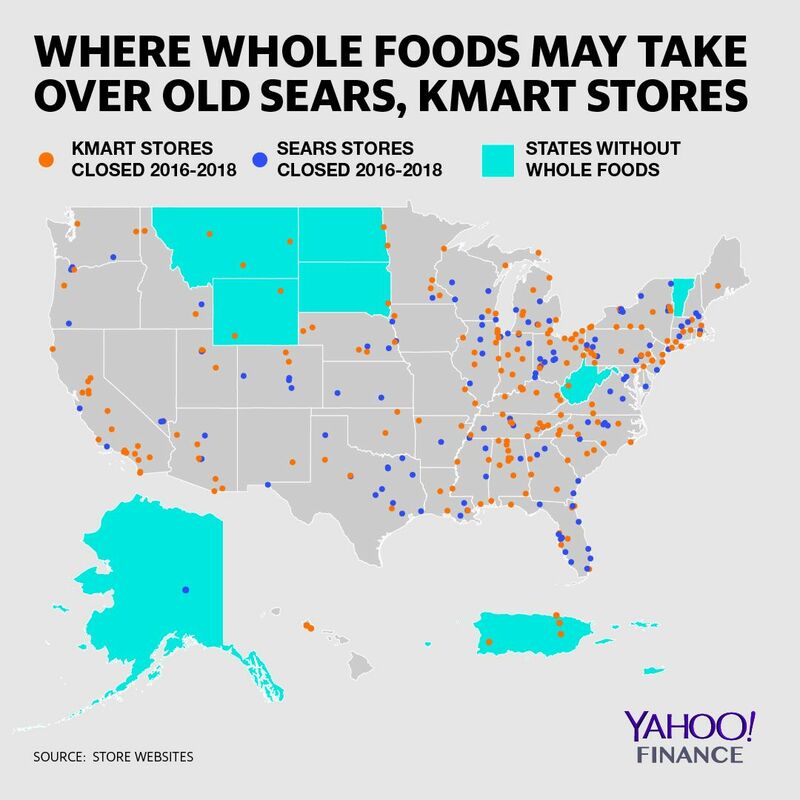 While Whole Foods concentrates locations around coastal cities and affluent neighborhoods, Sears’s national footprint spreads across the country and covers a broad demographic, which can help Whole Foods scale up fast at a relatively lower cost. “There are lots of vacant retail space that they can take advantage of, and that gives them access to reasonable retail locations, but I also think they want to secure good real estate deals by filling voids, and getting good rental levels from landlords,” Neil Saunders, managing director of retail at GlobalData told Yahoo Finance. Landlords are also increasingly interested in signing grocery and food retailers because they can help drive foot traffic to a strip mall, according to Saunders. Whole Foods didn’t respond to request for comments, but Jim Sud, executive vice president of growth and business development at the grocery chain echoed the strategy of using existing stores at a retail real estate event in Dallas on Tuesday. “First and foremost, we’re looking for the best location we can find. So if that’s an existing center–second generation space — that meets all of our criteria… we’ll jump all over it,” said Sud.